Exercise and physical activity today, has become as important and crucial as eating is. With our sedentary lifestyle creeping in and putting us at our worst shapes (and affecting our kids too) it is important for you, as a parent, to push your kids to be more active and exercise everyday. Not sure how to get started exercising with kids? Here are some ideas! Why not start with the simplest form of exercise there is- running? Whether it is running at home or outdoors in a garden, your kid will most likely not resist this one, and you can also combine it into different activities like hide and seek or a relay race. Running is a great activity that can get your kids started into some exercise, and can help do everything from building endurance to strengthening the muscles. Swimming is another great workout and exercise option, especially for growing kids who detest getting all sweaty. It has been known to be an excellent promoter of cardiovascular health, and does everything from boosting strength and stability to improving their balance and posture. You may be surprised at this, but swimming has also been found to reduce the risk of depression and boost mood significantly. To top that, it is one of the low impact modes of exercise, which means you can practise it even if you’re someone who’s suffering from joint pain. 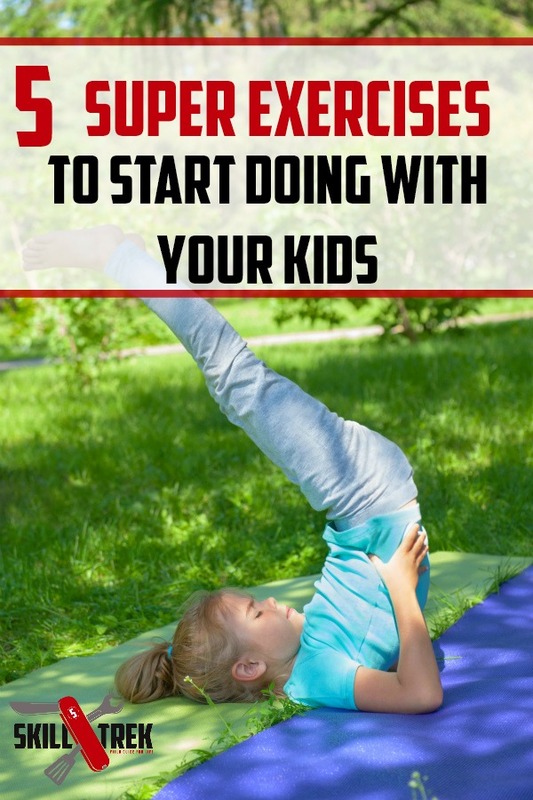 Sit ups are one of those classic exercises that work on your core and strengthen your upper body, and if you can get your kids to do them along with you, it can be great! Sneak in some push ups and planks as well to work those abdominal and core muscles and make them stronger as they keep growing. Oh yeah- there’s no going wrong with some good ‘ol squats isn’t it? You can do it and have your kids do it alongside as well. This simple bending exercise can help build leg strength in growing children, and also help them set a good foundation for sports and fitness activities. Start with the plain old squats and then try different variations gradually to keep things interesting and take them up a notch. Last but not the least, there’s no going wrong with the good old stretches guys! Yes, stretching also counts as exercise as opposed to sitting on the couch, doing nothing. Starting your morning with some stretching exercises with your kids, or spending some time in the evening doing it can really make a difference. Just a few simple stretches can help keep your (and your kid’s) muscles healthy and strong. The trick to keep your exercise routine going when it comes to kids is to bring in variations and the element of new into your workout sessions and not follow a single bland workout routine everyday. Do you enjoy working out with your kids? We’d love to hear what your favorite exercise is!